Efficiency: Before Richard Howe became Register of Deeds, it took 4 weeks to process a document. Now it takes 4 minutes. Digital Documents: Since Richard Howe became Register of Deeds, all records from 1629 to the present have been scanned and are freely available online at lowelldeeds.com. Innovation: New technology will soon make real estate closings paperless. With an extensive record in implementing new technology, Richard Howe will ensure that this change will be seamless, secure and legal. Homestead Protection: Massachusetts law allows homeowners to protect their homes from creditors by filing a Declaration of Homestead at the Registry of Deeds. Richard Howe implemented a one-stop process provides homeowners with the necessary forms, notary service and recording, all within minutes. Your Deed: Need a copy? Download for free at lowelldeeds.com or call (978.322.9000) or email and we’ll send you a copy for free. Legal Judgment: The Register of Deeds is a quasi-judicial official who must pass judgment on documents being recorded. As a lawyer with 30 years of real estate law experience, Richard Howe has the education and experience to ensure the legal integrity of our property records. Cybersecurity: In 2018, digital records are a target. Richard Howe regularly attends expert-led cybersecurity seminars and, as a former U.S. Army intelligence officer, has real world experience in safeguarding important information. Statewide Leadership – Richard Howe has twice served as president of the Massachusetts Registers of Deeds Association, is the chair of the Association’s Technology Subcommittee, and is the editor of the Massachusetts Deed Indexing Standards. The Future – In 2019, the Registry of Deeds will replace its computer system and will move into the new Lowell Judicial Center. Richard Howe’s experience with new technology and registry operations will ensure that these changes further increase the efficiency of the Registry of Deeds. 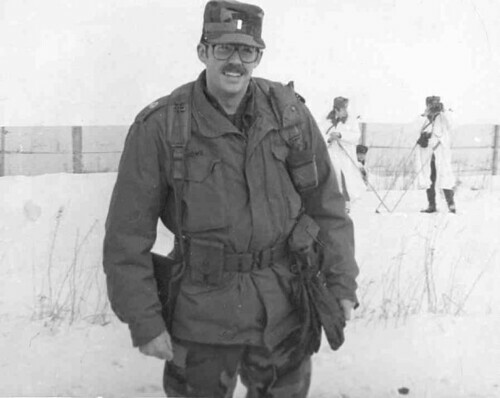 Richard Howe at East German border, 1983.